Comments: Jonathan Pitts, a longtime resident of Scottsville, is shown here in this photo taken on the back porch of the Pitts home on Main Street. In another photo taken at the Burgess Idylwood studio and shown at right, Jonathan holds a newspaper. His newspaper's headline, "Home Rule for the Philippines," would infer this photo was taken in 1902 when the Philippine national bi-cameral legislature was established. 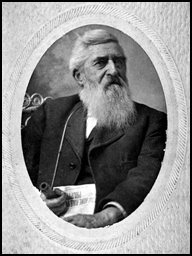 However, William Burgess, the photographer, knew Jonathan took a lively interest in the affairs of America and of Scottsville and perhaps felt a newspaper was a most fitting photo prop for a man who never tired of having the news read to him. Pitts also holds a favorite clay pipe, which he fired up daily to smoke 'Run, Johnny, Run' tobacco. As a child, Raymon Thacker often ran errands for Mr. Pitts, who by World War I was nearly blind from cataracts. One of Raymon's regular errands included running down to Dorrier's Store on Valley Street and West Main to buy a 5-cent pouch of tobacco for Mr. Pitts, and as his payment, a box of graham crackers for himself. Jonathan Pitts was born in Richmond, Virginia, on March 2, 1822, the son of Henry Pitts and Martha Cullingsworth. 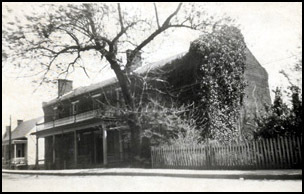 Henry Pitts built this large brick house on Scottsville's Main Street about 1831, and Jonathan Pitts lived there with his mother after his father died in 1849. Jonathan married Mary Agnes Snead on October 31, 1850, and the Pitts home soon housed a family that would grow to include thirteen children. Jonathan opened a small store on the side of his house and also entertained many old friends on its spacious front porch. The Pitts home, razed in 1955, was located on Lot 19 and 20, where the Chevron Station is today (2002) across from Scottsville Museum. (1) Baby Pitts - birth and deathdates of their first child are unknown. (2) David Henry Pitts (1852-1932), a prosperous Scottsville businessman, first in the packet and freight boat on the James River and Kanawha Canal and later as a railroad contractor. David represented Albemarle County for three terms in the Virginia General Assembly. (3) Luther Marion Pitts (1854-1945), a canal boat Captain on the James River and Kanawha Canal, later owned and farmed 1402 acres of land, once owned by Thomas Jefferson and called Elk Hill Farm. (4) Samuel Martin Pitts (1856-1861), died of a childhood illness in Scottsville. 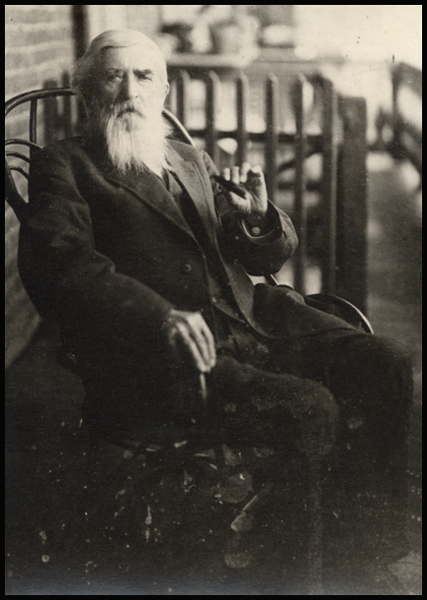 (5) Arthur Letcher Pitts (1857-1940), lived in Arvonia, Virginia, and owned a slate quarrying and manufacturing business called A. L. Pitts Slate Company. (6) Maria Teressa Pitts (1859-1862), died of scarlet fever in Scottsville. (7) James Roberts Pitts (1860-1860), died at age 3 months. (8) Lillian (Lillie) Pitts (1861-1929), married Ray Lindsey Stone of Scottsville on October 29, 1900. (9) John Lee Pitts (1863-1924), was a senior member of Pitts and Morris Company, a railroad construction business that by 1924 was considered the most extensive business concern in Virginia. Captain John L. Pitts also served as a member of the Albemarle County Board of Supervisors, representing Scottsville District. He and his family lived at Belle Haven Farm, which overlooks Scottsville and the James River. 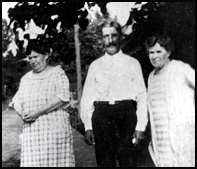 John married twice, first to Florence Lindsay Burgess, and after her death, he married Helen Amanda Burgess. John fathered eight children by his two wives: David Gordon; Arthur Marion; Clara Lee; John Lee, Jr.; Floyd Lindsay; Helen Virginia; Katherine Elizabeth; and Dorothy May Pitts. (10) Josephine J. Pitts (1865-1950), the last surviving child of Jonathan and Mary Agnes Pitts. She never married and lived at the Pitts home on Main Street, Scottsville, with her sister, Mary Agnes. (12) Mary Agnes Pitts (1867-1948), referred to as 'Aunt Babe' by her nieces and nephews, she never married and lived with her sister, Josephine, in the Pitts home on Main Street, Scottsville. (13) William Patteson Pitts (1870-1928), worked in railroad construction with his brother, John Lee Pitts. 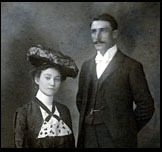 William married Betty Frances Pierce on October 20, 1900, in Washington, D.C., and they were the parents of four children: Agnes Pierce, Louise Patteson, William Robert, and Maynard Francis Pitts. In 1920, Jonathan Pitts died in Scottsville after contacting influenza, and excerpts from his Scottsville Sun obituary include: "Lacking just a little over 14 months of being 100 years old, Mr. Jonathan Pitts died at his home in Scottsville at 11:45 o'clock AM, Tuesday, December 28, 1920, after an illness of only 3 days. The funeral was held at 2:30 o'clock, p.m., the following day from the Scottsville Methodist Church, the Rev. J.E. Daniel, his pastor officiating. Burial was in the Baptist Cemetery with Masonic honors." "Jonathan Pitts, son of the late Henry Pitts, was born in Richmond on March 2, 1822. He was married October 31, 1850, his wife having been Miss Mary Agnes Snead of Spout Spring, Appomattox County. To them were born 13 children, eight of whom are living. There are 28 grandchildren and 22 great-grandchildren of the worthy couple. The wife died about 20 years ago." "The surviving children are: Mrs. Lindsay Stone of Arvonia; Misses Josephine and Mary Pitts of Scottsville; Messrs David Pitts of Scottsville; Arthur L. Pitts of Arvonia; John L. Pitts of Scottsville; Luther M. Pitts of Elk Hill; and William P. Pitts of Scottsville." The photos of Luther and John L. Pitts are part of the Kathleen McNamara collection. Kathleen resides in Scottsville, Virginia, and is the great granddaughter of Jonathan Pitts and the granddaughter of John L. Pitts. The photos of Jonathan Pitts (right) and Pitts House are part of the Raymon Thacker collection. Raymon grew up across the street from the Pitts family and spent many happy hours with Jo and Babe Pitts and often ran errands for the elderly Jonathan Pitts. The photo of Mary Agnes 'Babe' Pitts (early photo) is part of the Sean Linden collection. Sean resides in Scottsville, Virginia, and found this photo when his family moved into their home on Valley Street. He generously donated it to Scottsville Museum's photo archives. The remaining photos are part of the Robert Spencer collection. Robert resides in Scottsville, Virginia, and is the great grandson of Jonathan Pitts and grandson of William Patteson Pitts.